Scandinavian design style originated in the 5 Nordic countries such as Sweden, Norway, Denmark, Finland, and Iceland . Using of natural material and natural color, is the important thing on Scandinavian style. Why? Because the Nordic people doing activities in nature, like hiking, hunting, fishing, swimming, and camping. Even they like to do nature activities, the dark winter in Nordic country are very long. This makes the Nordic people spent much of their time indoors. So, to make them closer to the nature, they bring nature into their house. In designing, there are 6 principles in Scandinavian-style interior design, such as multifunctional, natural, color, lighting, innovation, and humanistic . One of the most important things is the use of color. Using natural materials and colors makes Nordic people more hygge. Hygge is an important secret ingredient for a pleasant Scandinavian lifestyle. Hygge itself means feeling comfortable and contented by enjoying the simple things in life. Because the design style took inspiration from the Nordic environment, the use of natural colors is very important to add atmosphere and impression closer to nature. The natural colors are the monochrome colors. The monochrome colors are the major colors used in Scandinavian style. White or off-white walls are very ideal as they create a bright, clean backdrop. White, gray, blue, black, and cream color are the mostly using color in Scandinavian furniture. 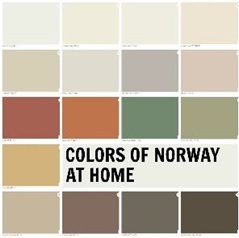 Those color are Scandinavian’s natural colors and become a trademark. And because the use of trademark colors it’s make Scandinavian design especially on the color becomes more flexible. This makes many other colors can blend perfectly in Scandinavian design. And that’s why Scandinavian design is becoming a trend now and is much liked by everyone. Scandinavian style is a design characterized by simplicity, minimalism, and functionality. The Scandinavian design style took inspiration from the Nordic environment. So, the use of natural colors is very important to add atmosphere and impression closer to nature . Can be seen in figure below on Scandinavian design style which shows many natural colors and monochrome wrapped with other complementary colors. Traditional Scandinavian style is simple, clean, cheerful. Scandinavian design also has many bright colors and fun patterns. Not only neutral colors, but other bright colors are also used such as floral colors. Can be seen in figure bellow on the color palette commonly used in Scandinavian designs. Kate Thorn (2016) in his article entitled “15 Colorful Scandinavian Decor Ideas for a Minimalist Spring Vibe” writes that the Scandinavian style not only plays in areas of natural monochrome colors such as black and white . However, the Scandinavian style is also combined with floral colors like pink, yellow, orange and green. Scandinavian style is a design characterized by simplicity, minimalism, and functionality. The Scandinavian design style took inspiration from the Nordic environment. So, the use of natural colors is very important to add atmosphere and impression closer to nature. Because the main feature of the Scandinavian style is its naturalness and simplicity. Scandinavian design has incorporated its community characteristic as a joy to solitude, love and genuine respect for nature. That is why Scandinavian-style interiors include minimal decor and are made with natural colors derived from simple and natural materials as well. As an example, on the use of wood materials. There are various types of wood in the Nordic region precisely in Sweden and Finland, such as wood from pine, fir, aspen, birch, maple, elm, and alder. The use of wood material is certainly a simple implementation of natural colors The identity and originality of this style can’t be denied. Just as color is capable to affecting a person’s psychology, the giving of natural colors to Scandinavian design also has other purposes. Very long winters and cold, cold streets in the Nordic countries have made many Nordic people depressed. To get rid of the gloomy and sad atmosphere, these Scandinavians saved themselves in a very bright house. There are blond wood, light stones, light pastel decorations, and various other natural colors such as the use of glass materials. Glasses refract and scatter sunlight so that the entire Scandinavian interior is based on light and shadow games. The rare and weak sunlight should be used maximally to support the use of monochrome colors. In Scandinavian homes there is almost no additional goods, useless accessories. Even glass vases are present simply because the glass transmits sunlight, refracts and reflects it, in other words, fills the room with light. The traditional Scandinavian homes have been designed to maximize sunlight. Stockholm is the darkest capital city in the Nordic region, with about 1,800 hours of sunshine a year and that is a small number when compared to countries on the equator . The Scandinavian design bases, and Nordic homes, will always be brightness and simplicity, as this is just Nordic people need for lack of sunshine. There are many Scandinavian style decorations that people love to work with every day now. And Scandinavian style is one of the styles that enter the ranks of design styles favorite of all time. The classic Scandinavian colored palette is on a striking black and white combo, yet comes with markings of gray and earth tones. Although known for its simple and controlled look, the Scandinavian interior is full of personality and warmth. onyx color is a rich black classic that works equally well with the main color or as an accent for the design. It plugs in nicely with colors and substrate. The elegant charcoal color is a dramatic charcoal creates a sense of calm in any room. Can be paired with white and neutral or light wood. Because of the use of wood that is very dominant, this color becomes the most color often used for furniture made from wood. The Medici gray color is the most beautiful gray for the kitchen. Usually used for white cabinet with quartz or marble table. Since the character of Scandinavian design is natural, this color defines the color of the stone. The white color of the stone is a very nice and elegant color wall color. This can be used for trim as well. Not only to color the walls, this color is also used to color the floor, pillow to the carpet. A neutral Golden Basketry is an exceptional choice of interior or exterior. Paired with rich, earthy chocolate makes this old and antique look. This color is also used on cabinets and chairs and other furniture. The fossil grey color is the perfect neutral color for the walls, sills, doors, up to the ceiling. A white print coat manages this color beautifully. This perfect neutral creates a soothing main wall for any interior. Usually combined with natural wood to stimulate a little texture in this place. This color is also used on the floor and sofa. Traditional Scandinavian style is simple, clean, cheerful. When thinking of this style, usually many white springs are thought. But, Scandinavian design also has many bright colors and fun patterns. Not only neutral colors, but other bright colors are also used such as floral colors. The use of monochrome neutral colors makes the Scandinavian design more flexible in accepting other complementary colors. In the spring there are many flowers in Nordics country, but unfortunately the long winter Nordic inhibit people. Using floral colors concept to give the impression of the flowers in the spring. Floral colors are most widely used in furniture as opposed to neutral colors. One example of floral color concept is lemon zest yellow color. The lemon zest yellow color is commonly used on pillows, blankets and bolsters for a cheerful effect among most of monochrome neutral colors. The bright lemon color gives the impression of a beautiful spring. The use of the Floral Finishing Touches concept is one of nature’s concepts in Scandinavian style. Nature is an important feature of the Scandinavian lifestyle, so the outer environment is brought into the design with natural and vibrant colors such as the use of greenish colors, either with indoor herbs or by painting cabins, cabinets, drawers and other small tables. Pink Work Accents are clean lines and organic shapes. This color concept is the emblem of Scandinavian furniture. This use aims to create a calm atmosphere and a feeling of spaciousness with a selection of simple furniture and pink roses are soothing. This color is widely used for the lounge until the work space. Not just floral color concepts, there is another concept such as Retro Accents. 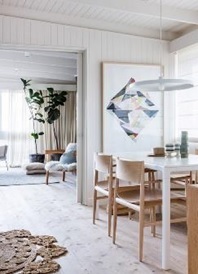 The Scandinavian house is famous for its white interior, and painting the pale walls will help reflect the light around and make the house look brighter. The use of pink, brown, red, and green to be very unique combination of this color concept. These colors can be implemented on carpets for glazed or concrete tiles, and blankets accompanied by colorful poufs. The next color concept is Neon + Neutrals. This color is used for sofas with cushions to create a relaxing place to rejuvenate. Suitable colors are a soft gray or brown sofa that is added with a color with Scandia orange, yellow or traditional. The use of this color to create a warm impression of a relaxed and comfortable. The latest unique color concept is Rustic Details. Because wood accents play a big role in Nordic style, and unfinished pieces of wood help create a sense of being connected to nature and the outdoors, a minimalist color palette is used, with a touch of metallic color to add a more vivid impression of wood color. Another color concept is Geometrics Galore. A common color like an old monochrome palette combined with a pink and gray palette brings a charming feminine look to a classic look. With additional geometric patterns to look fresh and modern. Not only feminine colors like pink color, rose gold color is also often used. The next color concept is Navy + Pink. This color concept is to combine different decorative aesthetics between Scandinavian color minimalism with indigo colors. Strong looks like dark blue materials and rustic materials that fit feminine accents like pink pastels and gold side tables create a winning combination. The last color concept is Copper + Neon. The concept of color is about creating a warm and inviting atmosphere. the use of metals such as copper and chrome to work in soft pink color – its ultra-polished look will add to the modern vibration without any industrial nuance. Suspended lights are great for minimalist look. Not only the coloring concept alone, but the use of patterns in various colors is also important to provide a Scandinavian accent. The patterns commonly found in traditional Scandinavian designs are usually simple, such as botanical illustrations with a symmetrical style. Animals are also a common theme. The commonly color used to be are poppy red hue, cream color, blue navy, yellow, and green. Modern Scandinavian patterns typically have bold colors and graphics, high contrasting style. The giving of natural colors to Scandinavian design also has other purposes. Very long winters and cold, cold streets in the Nordic countries have made many Nordic people depressed. To get rid of the gloomy and sad atmosphere, these Scandinavians saved themselves in a very bright house. The traditional Scandinavian homes have been designed to maximize sunlight. The rare and weak sunlight should be used maximally to support the use of monochrome colors. There are several main neutral colors in Scandinavian design such as deep onyx, elegant charcoal, medici grey, stone white, golden basketry, fossil grey, and white cliff beige. Scandinavian design also has many bright colors and fun patterns. Not only neutral colors, but other bright colors are also used such as floral colors. The use of monochrome neutral colors makes the Scandinavian design more flexible in accepting other complementary colors. Not only the coloring concept alone, but the use of patterns in various colors is also important to provide a Scandinavian accent. Alfari, S. (2017, January 20). Desain Gaya Scandinavian. Retrieved From https://www.arsitag.com/blog/desain-gaya-scandinavian. Alisa, S. (2017, May 9). Kenalan Yuk, dengan Ciri Desain Interior Gaya Skandinavia. Retrieved From http://idea.grid.id/Inspirasi/Interior/Kenalan-Yuk-Dengan-Ciri-Desain-Interior-Gaya-Skandinavia. Petrović, T. (2014). Mirroring Europe: Ideas of Europe and Europeanization in Balkan Societies. Netherland: Brill. Rodriguez, E. (2016, October 24). 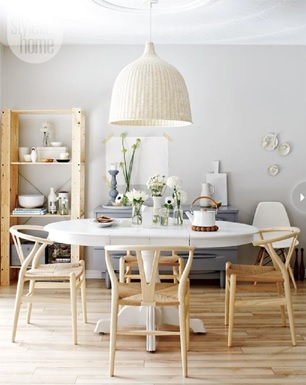 Love the Scandinavian Look? Try This Color Palette. Retrieved From http://mycolortopia.com/blog/color/love-scandinavian-look-try-color-palette#KPHmDfqXGUrfG1Dv.97. Thorn, K. (2016, March 31). 15 Colorful Scandinavian Decor Ideas for a Minimalist Spring Vibe. Retrieved From https://www.brit.co/scandinavian-decor-spring/.